From visiting the stock market and US Embassy in Mexico City to staying with local families and touring a five-star hotel in rural Amatlán, these Auggies are finding that the hands-on experiences offered by the program are a huge benefit. Kyle Soderberg, an Augsburg senior, says, "The interactive experiences—excursions and speakers—create learning at another level so it's more relatable to careers and the future." Hannah Carlson, Mara Pederson, and Grady Christopherson second this comment, claiming the meetings with businesses in Mexico City such as Boing cooperative and the Central Bank have so far been the highlights of the semester. The Augsburg students were initially attracted to the program for many reasons. Carlson was interested because she could study in both her international relations and Spanish and be in a foreign country that wasn't too far away from home. Soderberg said he was excited about the work experiences. He and fellow Auggie, Kaity Berg, will be working on the business and marketing plans for a local cooperative water park as part of their internship. Aside from the coursework in business and Spanish, educational excursions, and internship placements, CGE's business program also offers an opportunity for students to immerse themselves in Mexican culture. Berg says her greatest lessons have come from the interaction with Mexican people, especially during her four-day family home-stay in rural Amatlán. The experience made all the students look forward to their month-long home-stays with local families, which will begin in early November. 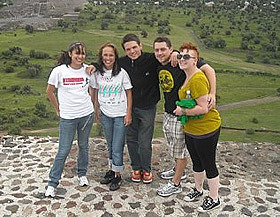 Relating their experiences in Mexico back to life at Augsburg will not be difficult, the students claim. Carlson is already making connections between what she has previously learned about NAFTA and the visits the group has made to local businesses. She says the presentation of opposing views is one of her favorite things about the business program. Soderberg agrees that the information he has learned in his major-specific courses is now "more relatable, more applicable, and makes more sense." As the semester progresses and students deepen their understanding about Mexico and international business, they will continue to post updates on their experiences in Cuernavaca on the International Business blog. Apply by October 15 to participate in the CGE International Business program next fall, go to the Augsburg Abroad website. Photo: Augsburg students (starting second to left) Kaity Berg, Grady Christopherson, Kyle Soderberg and Hannah Carlson atop the Pyramid of the Sun at Teotihuacan.